Finally, an honest-to-goodness trail run! 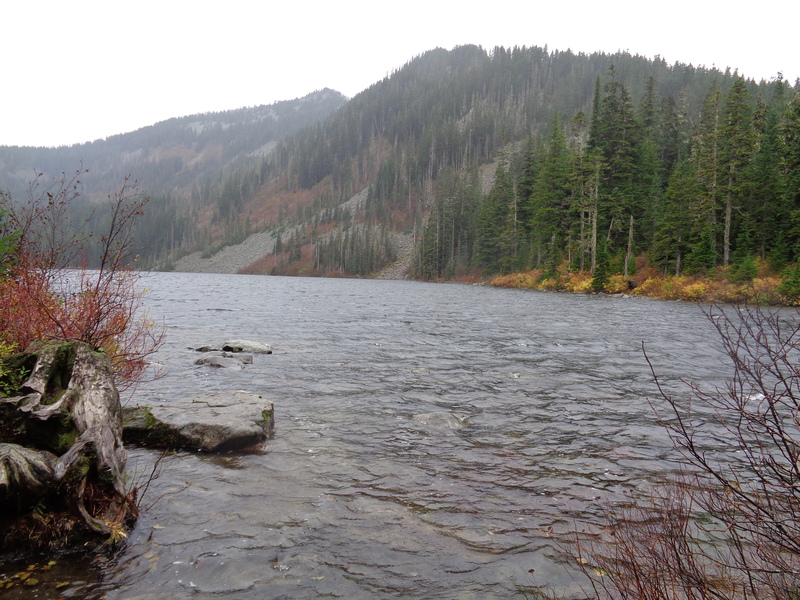 Many of my hikes have been too steep or slippery to run, but Pratt Lake was almost entirely runnable. Which is good, because if it wasn’t, I’d probably have turned back out of misery. Did I Trip: Ugh. Awkwardly stumbled and twisted my ankle. See below for details. Probably due to the weather, it was kind of a miserable hike. The type you do because you know you’ll be glad when you’re done with it. I had been sitting in my apartment for the past four days (okay, I went to work some of those days but the wanderlust was kicking in) so I figured I’d go anyway. Plus, it was a lake, so it couldn’t be that bad right? Lakes are pretty in crappy weather. Starting off it wasn’t that bad. The trail was in good shape, drained very efficiently so no muddy patches or swampy areas or rivers coming down the trail, and the mist was pretty cool at some points. I can definitely see why trail runners like this one, since the path is a wide, soft dirt path without many roots or rocks to navigate. 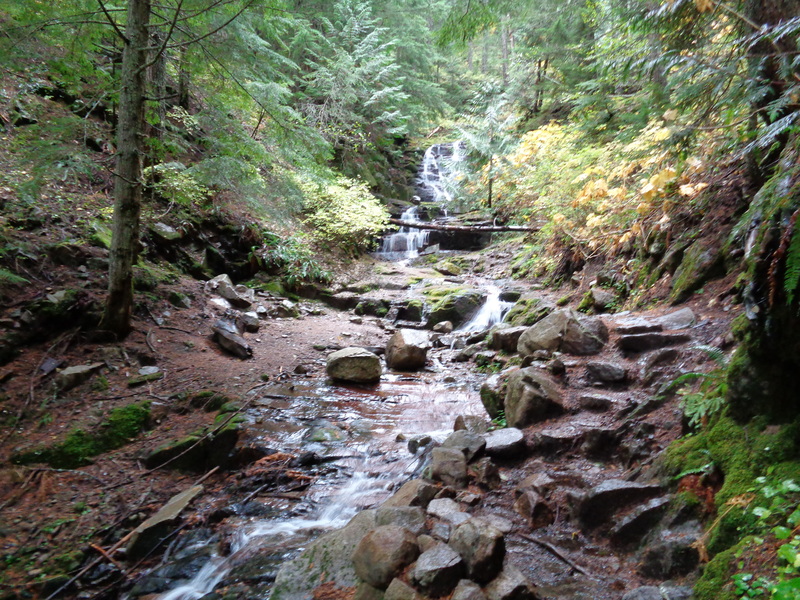 There were a couple pretty waterfalls coming towards the trail as well. There were a couple bridges that were a little slippery, but that was it until the trail splits and gives you the option of continuing to lake Talapus (.2 miles away) or Pratt Lake, another 3 miles away. After that junction, it got progressively worse. There were more muddy patches and more sections of the trail covered by small rivers. Two miles past that, along a ridge, there was another junction, this time with the left path heading to Island Lake and the right continuing on to Pratt. After this junction, the trail became nearly unrunnable. You lose a bunch of altitude heading down to Pratt Lake and the trail is steep, lots of big rocks and roots, crossing talus fields, and eventually winding its way though the basin, where everything was a swamp. The talus fields are pretty exposed – the wta description says bring sunscreen, I say bring a damn hat and gloves and windproof jacket. At this point, you can see the lake, so there’s no point in turning around. You skirt the slope above the lake for a while (runnable, thank god) and eventually drop down to the basin. This is where my misery kicked in. 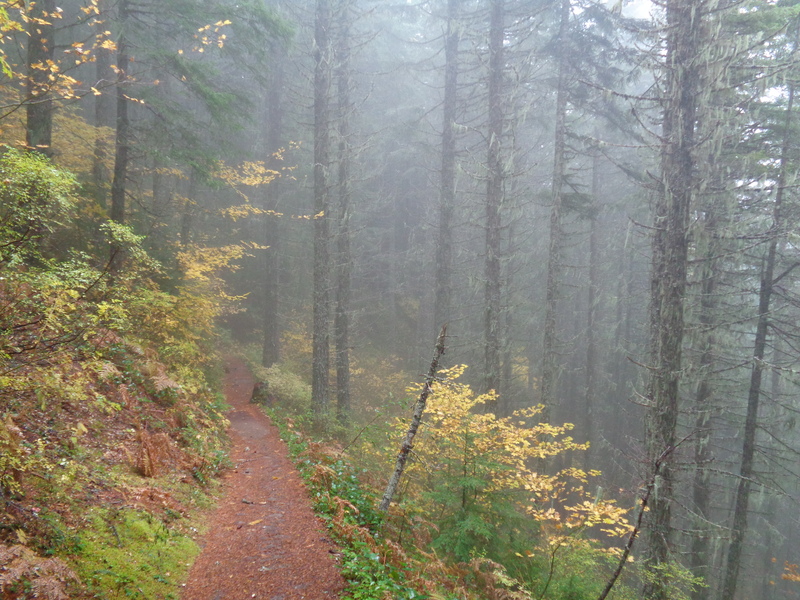 It was pouring rain, windy, cold, my gloves were soaked through, and I was six miles from the trailhead. And the lake was just a lake. No amazingly clear glacial water, no turquoise color, just a blue lake. I’m spoiled. Ugh. So I snapped just a few pictures to document it, turned around, and ran back. For a brief moment I had contemplated going to Island Lake, but after reaching Pratt, hell no. I was cold, impatient, and it wasn’t as much “yay running!” as it was a “just let me teleport to my car/apartment/shower/hawaii” type of run. I made it back in good time, with only one situation: my shoe came untied. Great. I tied it, and with my first step back on the trail (not even running) I twisted my ankle. Stepped weirdly on a rock I guess, I don’t even know. All I know is it hurt. But I was two miles from the trailhead and not about to walk through the pouring rain, so I kept running. The pain faded until I got home, which is when it decided to come back twice as bad. Luckily it only lasted a few days. To be fair I’ve been laying off it lately, so we’ll see this weekend how much better it actually is. When I got back to the trailhead, there were four other cars, but I hadn’t seen anyone besides one person. The rest must have gone up to Granite Mountain, which is a steep (1000ft/mile ish) hike with great views that shares a parking area with the Pratt Lake trail. Well, great views on a sunny day. Not sure they saw anything this time around. As much as I disliked this run, it’s probably a pretty cool summer backpacking trip if you’re into lakes. From this trail you can also reach Lakes Talapus and Ollalie, Island Lake, Rainbow Lake, Melakwa Lake, and Lake Tuscohatchie. In the summer, on sunny days, it’d be pretty nice to hit all those lakes and go for a couple swims. So I’ll give it a chance to redeem itself in a few months. 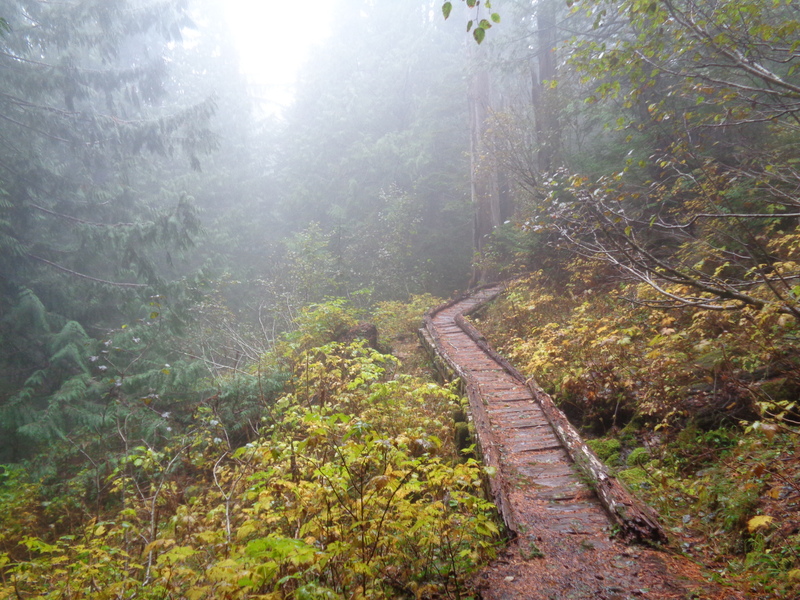 This entry was posted in Cloudy Days, Snoqualmie Pass, Trail Runs. Bookmark the permalink. You’re spoiled. You miss those hikes in suburban Chicago?